Brea, CA, August 04, 2017 –(PR.com)– Thump Records (“The party label”) to release “WhaBoom Song,” from Lucas Yancey, a bachelor on the hit ABC television show “The Bachelorette.” The “WhaBoom Song” is currently available for download via all digital providers and streaming services, including iTunes, Amazon and Spotify. 31 year old Lucas Yancey says “WhaBoom,” has been a part of his life ever “since the womb.” Well-known for The Bachelorette, Lucas “The WhaaaBooooom Guy” Yancey says he did not originally intend to make a song. After the fans’ reaction of his appearance on the show, he couldn’t resist creating a positive, summer jam – not only for his fans but for everyone to enjoy! "It was my dream to pursue music all along and ‘WhaBoom’ seemed like the perfect fun vehicle to launch my career,” Lucas says. Raised in Woodside, CA, Lucas, who also has a successful career in real estate, and as an actor, calls Los Angeles home. After his stint on “The Bachelorette,” Lucas has been interviewed by Jimmy Fallon, Jimmy Kimmel and Lara Spencer of Good Morning America. Lucas says, "The idea is to have 'WhaBoom' become a pop culture calling card which will help inspire people to follow their dreams, be who they want to be, and spread the love throughout the world. I just want to live without inhibition and live life to the WhaBoom Fullest. Dance, love, live, WhaBoom! Everyone has a little WhaBoom in them, they just have to let it out!" "The song is here to put a smile on people’s faces and make people want to dance and enjoy life. The core message of the song is to have fun, enjoy the moment and to 'WhaBoom' your destiny,” Lucas adds. The new single has a catchy, infectious beat sure to get attention from radio due to its ability to get people on their feet and into an instant dance groove! Clubs DJs are already seeing the power of the song to move the masses. Both Thump Records and Lucas Yancey plan on giving back by donating a portion of the proceeds to different children's hospitals. 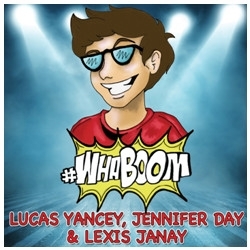 “WhaBoom” was created by singer/song-writer and actor Lucas Yancey aka Mr. WhaBoom, singer/song-writer and actress Jennifer Day and singer/song-writer/model/actress and dancer Lexis Janay. The song was produced by Danny Gonzalez aka Danny Boy and Tim Moore aka T-Why, with executive producers Bill Walker of Thump Records and Grammy nominated Pierre Patrick, Mr. Yancey’s agent. Distributed by Universal Music.